I hope everyone enjoyed their summer break and are ready to come back to classes which are commencing tomorrow Thursday 6th September – 7:00pm. I thought I’d outline what to expect as a reminder of what has been and what will be. We will continue to practice the Long Form as our major form exercise and also continue to embed and refine the Da Lu we have all learnt as a rule for this term. Whilst doing solo and partner practice over the break I thought it would be helpful to re-introduce the concept of weekly applications revision with a chance to review in order, hopefully every week, the applications of the Short Form postures on an ongoing basis. This will seek to both remind us all of the function of postures (which is vital to understanding the Jin level the 3rd level of practice in Dr Chi Chiang-tao’s levels of Taiji). Jin level is important to comprehend because it helps us understand the internal structure of how the body moves in order to perform the function of the application. We will continue with the Da Lu we have learnt to further refine it but between now and Christmas I would like to start teaching the next Da Lu too which is the first one I learnt and is 7 postures long, and again is a 2-person exercise helping us to understand Taiji application concepts with pre-arranged movements. I would like to take Push Hands further so all students feel able and well practiced at Roll-back, Press and Push as a standard practice of Push Hands. Between now and Christmas I would also like to take my lead from the Taoist and Traditional Chinese Medicine line of though of teaching The Crane qigong exercise as with Taoist thought Autumn is the season of the element Metal and relates specially to both the Lower Intestine and the Lungs. As ever the classes are yours and the direction is aided by myself to help all students develop and advance in Taiji for the benefit of your own personal mastery. 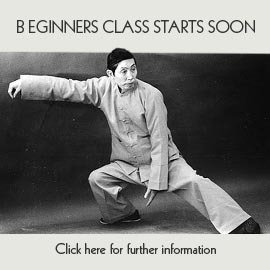 Regular practice and repeated practice are the key in Taiji and after the first term back I will also re-visit for one 10 week term Yang Cheng-fu-‘s 10 essentials of Taiji which we will nimbly slip into every lesson. If you have not practised as much as you have wanted to over the Summer have no fear as Thursday class will also offer up a good opportunity for revision and questions on basics as well as specifics as ever. I will text you all as well and hope to see you all tomorrow.